How Does Money Impact Our Romantic Relationships? 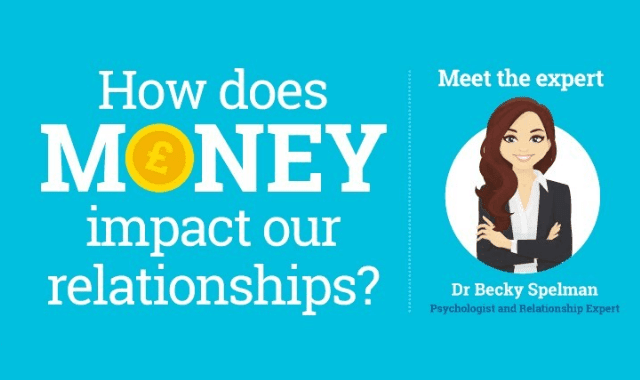 #Infographic ~ Visualistan '+g+"
Shepherds Friendly carried out a survey and partnered up with psychologist and relationship expert, Dr Becky Spelman to find out more about the power that money can hold on relationships. The infographic includes some interesting results, such as more men than women agree that men should pay on date night and another finding was more women feel that men should split the bill than men. There are many more interesting results in the infographic. Dr Becky Spelman analysed the survey findings and shared what the results could mean, and then gave relationship advice based on the findings. You can see the interesting results via Shepherds Friendly infographic below. You might find that you learn a thing or two about why you or your partner might behave in a certain way, when dating or in a relationship. In the infographic we can see that money – or more accurately the sense of security access to money brings – has an impact on every area of life, including love, romance, and dating!